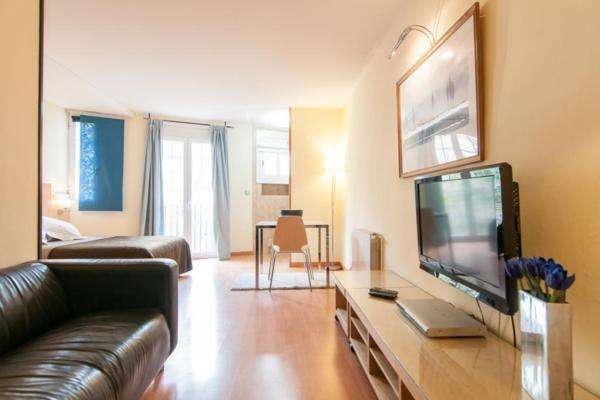 This cozy studio apartment in Barcelona is located in the Gràcia district, a fantastic location for those seeking a cultural trip to the Catalan capital. This neighborhood offers visitors a unique personality with an array of international cuisine, independent boutiques and some fantastic sights such as Gaudí´s famous Park Güell! In the open living room, you will find a comfortable sofa, TV and a double bed. The kitchen is well-equipped and the sizable bathroom has a bath/shower. All linen and towels will be provided for your stay. There is an Internet connection also available. This modern studio apartment can accommodate two people. Situated in a nice location, it is perfect for those who are looking for a home-away-from-home during their holiday!